There are few things in life that taste good and are good for you, too. One exception? Nuts! Long thought to be harmful to your health due to their high content of calories and fat, experts are now saying that a handful of certain kinds of nuts goes a long way for your health and your fitness. Go nuts and get fit. Fuel your workouts and busy days by gobbling down the good-for-you snack in a shell! The FDA reports that eating 1.5 ounces of nuts a day may reduce the risk of heart disease (nuts lower the level of “bad” cholesterol, called LDL). Plus, some nuts, like walnuts, are chockfull of omega-3 fatty acids, which have anti-inflammatory capabilities and can help speed up the healing of exercise-induced muscle tears. 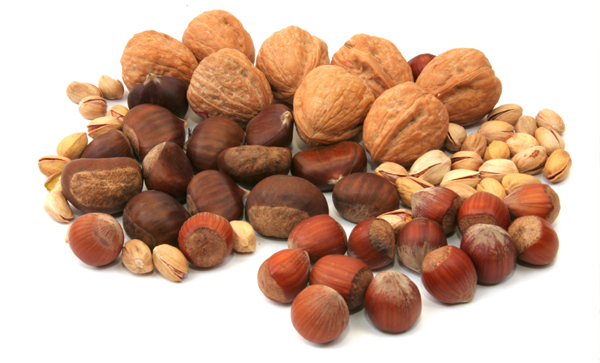 Read on to find out which nuts are best when it comes to your health and fitness. Next time you are cruising down the snack aisle at your grocery store, skip the chips and fill your cart with some of these good-for-you nuts. Almonds: A cholesterol-lowering, heart-healthy snack, one serving (about a handful) of these teardrop-shaped snacks provides 35 percent of the Daily Value for vitamin E, which can protect against some cancers and other diseases like Alzheimer’s. Try them in Almond Scones for a tasty start to your active day. Hazelnuts: Expecting a baby? Curb your cravings with a handful of folate-filled hazelnuts and reduce your risk of birth defects. Even for non-moms-to-be, the B vitamins in hazelnuts also fight off cancer, depression, and heart disease, while doses of calcium, magnesium, and potassium can reduce blood pressure. Try them in this Gingered Brown Rice with Dried Fruit and Hazelnuts as a delish post-workout meal. Peanuts: The most affordable nut around is also one of the healthiest. Packed with protein, peanuts also contain a natural chemical called resveratol, which experts say fends off heart disease. And to get technical, peanuts are not actually nuts, they are legumes. Either way, they are good for you! Try them in Vietnamese Style Beef Skewers with Asian Slaw and Peanuts as a regular dinner entrÃ©e, especially during training season. The protein-rich beef combined with the fatty acids, carbs, and protein of the nuts is a boon for your sports nutrition. Pecans: These holiday staples are among the top 15 sources of antioxidants among all foods, and are said to lower cholesterol by decreasing LDL build up in the arteries. Plus, with extremely high levels of the plant chemicals phytoserols, pecans are an awesome defense against cardiovascular disease. Try them in Pecan Crusted Salmon with Mesclun and Honey Mustard Dressing for a filling, healthy recovery meal after a long mid-morning workout. Pistachios: Pistachios have the least amount of calories and fat of all nuts, plus a 1-ounce serving has three grams of fiber. Studies show that those who eat 1.5 ounces of pistachios a day will lower their cholesterol levels. Try them in an Herb Salad with Strawberries and Pistachios as a light lunch before your daily mid-afternoon workout. Walnuts: Rich in omega-3 fatty acid ALA, walnuts can help reduce your risk of heart disease, cancer, stroke, diabetes, high blood pressure, obesity, and clinical depression. Walnuts may also decrease inflammation that can lead to artery damage and the breakdown of bone. Try them in Chinese Chicken Garnished with Toasted Walnuts for a light tasty dinner after a hard workout in the hot weather. Not all nuts are created equal. Some, like the sizeable Brazil nut, tasty macadamia, and hearty cashews are packed with potentially artery-clogging saturated fat. While these nuts do offer some benefits (cashews, for example, contain immune-system boosting copper, magnesium, and zinc; Brazils have a high amount of selenium, the mineral that helps eliminate cancer-causing free radicals in your system), it’s best to eat them in moderation to protect your heart. And bad news for nuts-in-a-can lovers. Prepackaged nut mixes are often laden in salt and oil, which, of course, detracts from any health value you would get from eating them plain. So stick to the raw (or toasted) and unsalted versions to pack a nutritious punch into every bite.